It is two years today that Noah was wounded. I wasn't going to write about it. It's "old news". But then I watched a special report on ABC News "War on the Brain: Understanding TBIs" hosted by Bob Woodruff, himself recovering from Traumatic Brain Injury. I watched the original February 2007 Woodruff report on his recovery that featured these same soldiers as they recovered from TBI. When I saw the dramatic recoveries of some of the soldiers who in February could hardly walk or speak and who are now walking, running and speaking almost without affect, I cried happy tears... happy tears for them, for their wives and for their families. And when I saw those soldiers who are recovering more slowly... or whose recovery is as good as it is going to be... and I witnessed the despair or the optimissim of the mothers and wives who have become the primary care givers, I cried tears of loss and of sadness... for all that was and all that may never be. It brought all the feelings and emotions of that horrible night in August 2005 back in waves that seemed surprisingly fresh and raw despite the passage of time. So remember those who are still in the fight on the battlefields of Iraq and Afghanistan and other places in the world... and those home but who brought the battle with them... and those that bear the wounds and scars of war... and will for their lifetimes... and the families of those who serve, have served, will serve... and remember to help and support our troops and those who have served and carry the torch to finish the mission. We will and we must always remember. Thank God for people like these. Two years ago at just about this time I was dialing you number and shaking like a leaf, then your DH answered and it was all I could do do keep myself together to get the few words out of my mouth that I somehow managed to utter to him. Here I was sitting at home with a huge smile on my face as I had my son home safe and sound on R&R and yours was somewhere in a hospital n Iraq and you not knowing how sever his wouds really were. I remember it like it was yesterday, and I have sat here right by myself tonight and said a short prayer for you and your family as a few tears ran down my cheek and a few cold childs ran all over my body. Glad to know he is finally home with youand DH. 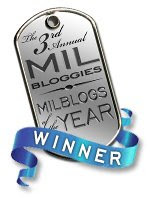 I check your blog every week and the emotion that you express in your blog brings tears to my eyes every time. I wish Noah, M., you and DH the best of luck and all the happiness in the world. And please, never think of that as 'old news' because as monumental as it is, each year there will be new lessons learned, new frustrations and someday lots of new, happy milestones. Here at our house, we think of you often, pray for you much and wish you & yours the best as you keep on moving. And I remember too. I'd just started reading your blog a week or so earlier and when I read about Noah my heart broke for you. But we military moms are a strong lot. Somehow we manage to scrape together the faith that gives us the strength that our children never outgrow the need for. They know that their mom's faith is there - that they can always count on our prayers and our trust in a loving God. He will bless you in all of this - it may not be real clear right now, but there will be a blessing in it. I pray that each day you are embraced by the loving God who answered your prayer those two long years ago. I am relatively new to the milbloggosphere, and your stories are new to me, but I don't think that hearing what you all went through during that time is old news ever. It is something that Noah lives with everyday, and you as a mother of course will always have that sympathetic path to walk with him. I am holding my breath as we head into that dreaded September. I am praying that I never have to face what you went through, but I know if I am ever on the receiving end of the news I will not have to blaze a trail alone. My fellow "mothers in arms" are there -- as we are here for you. God bless you and Noah! 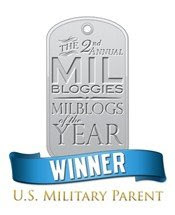 I too am one of your loyal readers, being a new Military mom you are one of the few Military Mom blogs and have been a great supportive read for many of us. I am glad your son is starting a new part of his life, I wish him and his new family a wonderful life. I am sure with a Mom like you how can he not.. I remember too, crystal clear.... (((hugs))) y'all were in my prayers then, and continue to be there now.